When you decide to buy or invest in a forklift, do you ever consider what types of tires you should use for its smooth operation? How seriously do you take the tires of your forklift? Do you consider regular replacement and maintenance? Do you use the right type of tires? These questions should serve as a guide in your hauling business and as you read on below, it should teach you about the best types of tires available. 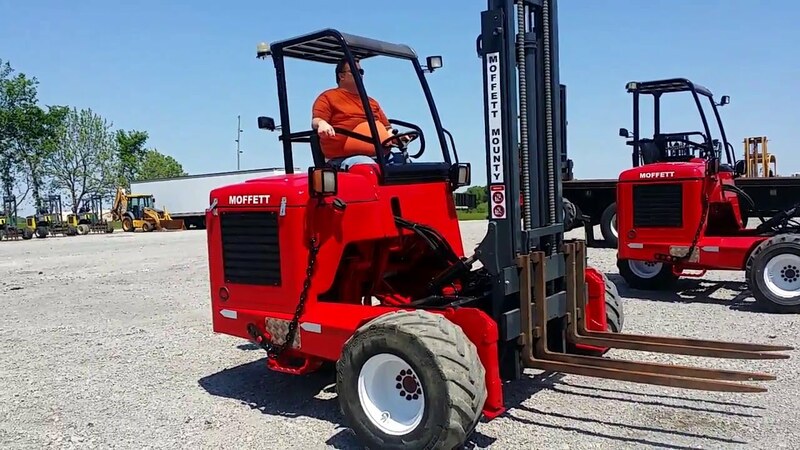 It will give you a clear understanding of the tires of your Moffett forklift for sale, and some information on its maintenance. There are several types of forklift tires available today, but the most common ones are the pneumatic or solid ones. Each tire of a forklift has a different compound, tread and ply rating, and this help to ensure the tires serve the best application. In addition, if you keep the tires of your lift truck in the best shape, this should help to reduce the wear and stress on the transmission and the driver. Maintenance of the tires at such times improves performance, fuel efficiency, and improves overall safety. In general, there are two ways to fit the tires of a forklift, including the standard or press on. When it comes to fixing press on tires, this is a straightforward task, but when it comes to harsher types of terrains, they are less durable. The fitting process of standard tires is a lot similar to fitting tires of a car. Often the drivers calculate the load expected by each wheel first before they fit any tire. Usually, forklift experts like Bobby Park dealers in used and new forklifts suggest that the best tire is the one that carries a load under low inflation pressure. Moreover, the nature of the work that the forklift will carry out, under environmental conditions is also a factor to consider. Note that if you plan to put your used forklift to the brutal limit, you should use a pneumatic or thick tire as the ideal choice. Some rubber tires are also ideal, which are puncture proof, and used commonly on smooth surfaces. For outdoor use, polyurethane tires are ideal. However, let’s take a closer look at the various types available for your forklift. These are press on tires, made with a rubber attached to a metal band. They are ideal for smooth pavements and various warehouses that have concrete flooring, where space could be an issue as the cushion tires have a turning radius that is smaller than the pneumatic ones. These are a lot similar to truck tires, they have a thick deep tread, filled with air, strong-wear or resistant rubber. They are a good choice for the extended running of a forklift, and it provides a cushion effect between the ground and the forklift. You can operate it on rough or uneven surfaces. Compared to pneumatic, you can say they are the same, but the main difference is they do not have air filling and do not provide the cushioning type of effect. As their name suggests, they do not go flat or puncture and last long. They are excellent for light outdoor and indoor use, but not suitable for uneven, rough, outdoor surfaces. These tires have special resin fillings, which provide constant pressure, at the same time preventing punctures in the tire. They are more like air tires, meaning they provide cushioning effects to the lift truck without any risks of punctures. These are famous for indoor forklifts. Pressed onto the wheel, it is one of the easiest ways to put on a tire. In addition, they offer an adequate level of traction for indoor use and it possesses some rolling resistance, which helps to extend their running life. Generally, you can find this type of tire on indoor forklifts like walkie stackers and reach trucks. Such options come with special designs, to prevent any marks on floors. Often, food processing and grocery factories use them. However, the main drawbacks of these tires are that they do not have carbon black, which shortens their lifespan consequently. To ensure that you get the greatest usage out of your tires, you need to make sure that you implement good driving habits. Refrain from sudden starting, quick spinning, or sudden braking. Note that locking one wheel and making sharp turns, or high-speed cornering also has a damaging effect on the tire. You should avoid these bad habits, which in return will extend the life of your forklift significantly. In addition, you should ensure that you check the pressure levels every now and then, which will ensure your forklift tires, have a longer life.